Before I became a believer, I assumed that the origins of Christianity were lost in a sort of haze of the past. I took it for granted that what we call “Christianity” developed in the early middle ages, and was far removed from the simple religion of Jesus. I think many people believe this today. This assumption that Christian beginnings – apart from what we learn in the New Testament – are distant and obscure persists even among Christians. This especially true among many Evangelicals, who view the sacramental life of liturgical churches as a late historical development that distorted the purity of Biblical religion. My life changed when I discovered that the beliefs and practices of early Christianity are thoroughly documented all the way back to the beginning. Following closely in the wake of the New Testament is a group of writings called the “Apostolic Fathers,” written within a generation or so of the Apostles. I first discovered them in a thin Penguin volume [Early Christian Writings: The Apostolic Fathers (Penguin Classics)] that I purchased in a bookstore in Bristol, England, almost thirty years ago. I remember pouring hungrily through these letters written by people like Clement, Ignatius, and Polycarp as I took the bus back to Wales where I was staying at the time. I was amazed to discover a continuity in the Church’s life that goes all the way back; it suddenly hit me how credible Christianity really is! Most seminarians – at least in the Anglican tradition – read those earliest Christian texts in their first few months of seminary, but for lay people these writings are largely unknown. This is unfortunate, because these texts are not merely of antiquarian value; they demonstrate our connection and kinship with the first generations of Christians. This is true for all Christians, but especially for those with a rich sacramental life – because we discover that the experience of Christ in the Eucharist that is central for us is also prominent in the earliest Christian writings. 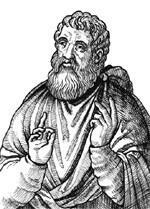 One day in the first half of the second century, a Greek-speaking pagan philosopher named Justin went for a walk along the beach of the Mediterranean Sea in the Roman province of Palestine. Along the way he met an old man who was a Christian. As a result of their conversation, Justin himself became a Christian. In time he applied his philosophical training and became a leading Christian teacher in Rome. Coming immediately after that early generation of “Apostolic Fathers,” Justin was the most important of a subsequent group of Christian writers known as “The Apologists” – so named, not because they were “sorry” for being followers of Christ, but because they offered a rational and persuasive defense of the Christian faith to a hostile culture. In Justin’s first “Apology,” written about 150 to Emperor Antoninus Pius, he argues (not always convincingly) that Christianity is consistent with Greek philosophy, and is the fulfillment of pagan philosophical aspirations. Equally interesting – especially to us – is his description of the Eucharist. Justin’s account of how Christian worship in his day is amazingly similar to our own familiar Eucharist contained in the Book of Common Prayer. On the day called Sunday there is a meeting in one place of those who live in cities or the country, and the memoirs of the apostles or the writings of the prophets are read as long as time permits. When the reader has finished, the president in a discourse urges and invites [us] to the imitation of these noble things. Then all stand up together and offer prayers. And, as said before, when we have finished the prayer, bread is brought, and wine and water, and the president similarly sends up prayers and thanksgivings to the best of his ability, and the congregation assents, saying the Amen; the distribution, and reception of the consecrated [elements] by each one takes place and they are sent to the absent by the deacons.…We all hold this common gathering on Sunday, since it is the first day, on which God transforming darkness and matter made the universe, and Jesus Christ our Saviour rose from the dead on the same day. 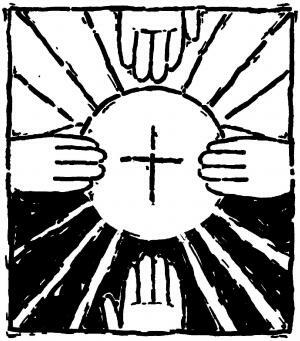 The celebration of the Eucharist is a weekly event, “on the day called Sunday.” The service follows the shape of the liturgy with which we are familiar. It begins with readings from Scripture (“memoirs of the apostles” and “writings of the prophets”) followed by a sermon in which the “president in a discourse invites all to the imitation of these noble thing.” Prayers follow, and then an offertory in which “bread is brought and wine and water.” The celebrant prays over the elements and “sends up prayers and thanksgivings” in what we would call the “Eucharistic Prayer,” or “Great Thanksgiving,” followed by a statement of assent with the “Amen” and the receiving of communion. our flesh and blood are nourished by transformation, is the flesh and blood of that incarnate Jesus. Justin believes that the bread and wine changes. But that change is not just some sort of magic. It is grounded in another more fundamental change that takes place in the Incarnation, in which “God’s word took flesh and blood.” But there is also a third change: just as the Word takes flesh and blood “for our salvation,” so also our flesh and blood are “nourished by transformation” when we partake of the food consecrated by a word of prayer. Yet these are not three separate transformations, but a single three-fold movement. For Justin, the Incarnation of the Word is the center of everything. 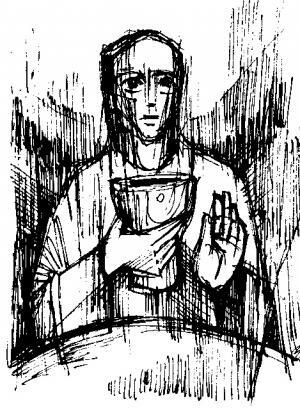 What we call the “Real Presence” of Christ in the Eucharist is not an additional divine act, but is subsumed into that divine movement in which the Word becomes flesh. It must not be conceived as distinct from the event of the incarnation, but is rather an extension of it – just as we ourselves, as the Church, are adopted into Christ, and become the “Body of Christ” and an extension of the Incarnation in the world. Justin offers us a window into the worship life of the early church. This witness demonstrates that the doctrine of Real Presence is not just something that the Church made up as it went along; it goes back to the beginning. Justin himself stresses that this is not his own personal theology, but something “we have been taught.” One can easily demonstrate continuity between Justin and those who preceded him in the Apostolic Fathers and the New Testament itself; this would require another article, but the evidence is there. It is enough to know that as we come to Christ in the Eucharist, we experienced anew “…that which was from the beginning, which we have heard, which we have seen with our eyes, which we looked upon and have touched with our hands, concerning the word of life” (1 John 1:1).